This band is called “Battlecross” and they named their second album “Pursuit Of Honor”. Battle, Cross, Honor: 3 Metal keywords. And then look at the cover of the album: there’s a sort of mutant (half muscle, half skeleton, how is this possible??) that is carrying a machinegun and it’s wearing bullet-belts. It’s also got a gasmask and there’s some sort of mutant army under his command. Wow. You’re thinking pure Metal Clichés right? Who dares to say that Metal music is only about violence? And the music is EXACTLY the same way: 100% Metal & Muscle, nothing else. There aren’t even hard-rock influences here, it’s like Battlecross has chosen to play a blend of Death, Thrash and Metalcore. It’s also obvious that he guys like both the American scene and the European Melodic Death Metal bands. They kind of mix the American natural groove with the European science for epic melodies. A guy who reviewed the album found some similarities with another cool band called The Absence, and that is signed on the same label (Metal Blade). The comparison is completely relevant as both bands are absolutely unoriginal but very talented, and they display an unbelievable amount of energy. Their sound is however pretty different as The Absence has no Metalcore influences at all. But let’s get back to Battlecross’ main strength: ENERGY. Their music is fast, groovy, powerful, everything we love about Metal. Bassist Don Slater also shows some impressive talent as his groovy lines really stand out. I also love the fact that the band has injected some very fast & brutal parts and cool guitar solos. Pursuit Of Honour is short (hardly more than 36 mins) and full of clichés. It’s also unbelievably dense and it’s like an energy-shot that will give you that stupid yet fantastic feeling of "liquid metal flowing through your veins". 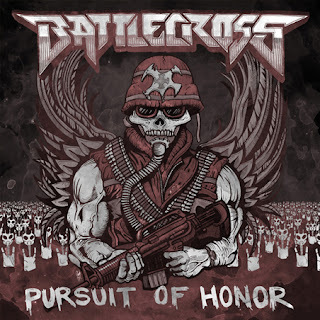 Battlecross is an embodiment of everything you love about Metal. Metalcore has gone silly, some Metal bands like to add progressive influences and everybody’s crazy about hard-rock these days. Meanwhile Battlecross are still on the field, and they are defending the Metal Flag with impressive power, commitment and of course honor. This is an easy [4/5].